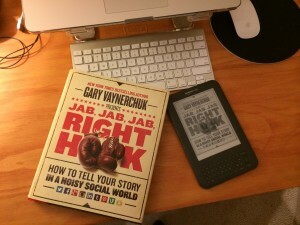 Since the release of Jab, Jab, Jab, Right Hook written by Gary Vaynerchuk there have been many reviews of the book. One for the office and one for the road. We wanted to add our thoughts on it. This is not a New York Times book review, rather a review by a small business that is looking to stay current in a ever changing social media world. When we started our business back in 2010, we read Gary’s first book “Crush It” after hearing this passionate guy talking on New York sport radio about wanting to buy the NY Jets Football team. That book was about taking your passion, executing it, and knocking it out of the park using all the media tools available to us in this day and age. He taught us that you no longer needed a middle man to get your message out to the masses. It was up to you to provide something great and put it out there using these new media outlets. Here at the end of 2013 he follows up with Jab, Jab, Jab, Right Hook. This book is more of a manual on the details of social media, a how to book with lots of case studies and colorful pictures (not to mention a nicely printed book on glossy paper.) He shows us that social media is a marathon not a sprint. He compares it to the sport of boxing and shows us how the “sweet science” of boxing can be applied to social media. “Jab, Jab, Jab, Right Hook” is an analogy for “give, give, give, ask.” A jab is giving and a right hook, according to Gary, is asking your customer or potential prospect to do something. If all you do is throw right hooks, you are not going to find success. You need to set up the ask the same way a boxer sets up a right hook with a series of jabs. You need to do a whole lot of giving first before you can ask for anything. Gary shows you the nuances of each social media channel and how to take advantage of them. Each platform is different and should be treated accordingly. You wouldn’t run the same exact ad on television, print and radio so why are companies doing that with social media? The same picture you post on Instagram may not work as well on Pintrest. Gary goes through each platform and show you what to do and what not to do. The case studies in the book are excellent, each one showcasing the best of the best as well as the worst of the worst. These hands on examples really make the book effective in showing how to tell your story on social media. After reading this book we are currently making adjustment to our social media strategy. Page after page we are reminded that these are extraordinary times we live in, small businesses and individuals now have access to the same platform as the big brands and major companies do. It is as much about your story as it is the product or service you offer. It’s very noisy out there in the social media landscape, but with good storytelling you can be heard. Jab, Jab, Jab, Right Hook was written for those of us that can not afford to pay Gary’s company, VaynerMedia, $80,000 a month for content and marketing. It is his gift to all those entrepreneurs out there that are looking to get their product or service out to the world. Think of the purchase of this book as the best value you will get all year long. You want ROI, you got ROI on every page of this book, by the time you finish reading this book you will feel like you sat down with a digital marketing agency and they handed you the holy grail. In his own words Gary “crushes it” again with this book and leaves us all thanking him for his wonderful content.